Stay connected whether you're on land or in the sea with the quatix 3 from Garmin. This marine-focused sport watch features several seafaring modes that will assist you whether you're fishing, cruising, or sailing. It's equipped with a stainless steel EXO antenna with both GPS and GLONASS support for enhanced signal acquisition and navigational support. Additionally, it houses an array of ABC sensors – 3-axis compass, altimeter, and barometer – that provide relevant real-time information, including elevation data, weather prediction, and bearing data. The quatix 3 is more than just a marine wearable. It features several of the same activity and multi-sport modes popularized in Garmin's other wearable devices, including running and cycling dynamics, activity tracking, and more. The quatix 3 can also be paired with optional fitness devices, such as the HRM-Run or a compatible heart rate monitor, for even more advanced fitness data monitoring. Additionally, the quatix integrates with several of Garmin's other devices, including the VIRB, Vector, certain GPSMAP chartplotters, and more. For notifications and wireless connectivity, the quatix 3 interfaces with your compatible smartphone using Bluetooth Smart technology. Wi-Fi and ANT+ technology are also built in for more connected options. The quatix 3 comes with two bands: a black leather strap and a blue silicone band. Band removal tools are also included, so you can quickly switch out bands to meet the occasion. The quatix 3 can stream NMEA 2000 data from compatible fixed-mount Garmin electronics. With a quick glance, you can check your speed, water depth, temperature, wind data, and more. You also have access to up-to-date tide data downloaded for your area to quatix 3 through your smartphone. There's a standalone Man Overboard (MOB) button that allows you to quickly save a location if a crew member goes overboard, so you can navigate right back to the site. Additionally, it's preloaded with a wide selection of marine-themed watch faces you can choose to make a statement about your nautical interests. quatix 3 is equipped with ABC sensors to provide relevant real-time information. The built-in altimeter provides elevation data to accurately monitor ascent and descent, while the barometer can be used to predict weather changes by showing short-term trends in air pressure. The 3-axis electronic compass keeps your bearing whether you're moving or not. The quatix 3 auto-calibrates its ABC sensors using its GPS receiver and also auto sets the time based on location. quatix 3 provides comprehensive navigation and tracking functionalities to guide you across water and off the beaten track. Its built-in ABC sensors provide information on heading, elevation, and weather changes. Additionally, it records a GPS track log as you move and enables you to mark locations, store up to 10,000 track points, plan trips, and much more. More than just a marine smartwatch, the quatix 3 also includes several training features to tell you about your running form and overall fitness. When paired with a compatible heart rate monitor or the Garmin HRM-Run (sold separately), the quatix 3 can tell you your VO2 Max estimate, your running cadence, vertical oscillation, and much more. The quatix 3 also supports multiple fitness activities and features modes and data analysis targeted at each sport, including swimming, golfing, cycling, skiing, and more. Remote control capabilities are also available with your quatix 3. Download a free app from the Connect IQ store and you can control your FUSION stereo from anywhere onboard – right from your wrist. You can adjust volume, change tracks, and more. You can also remotely control both the music from your phone and your VIRB XE action camera. Personalize quatix 3 with free downloads from the Garmin Connect IQ store. You can customize your watch face, add data fields, and get apps and widgets that provide the information you need at a glance. 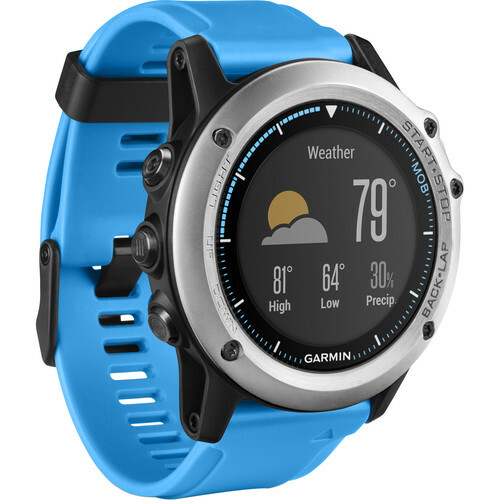 Connected features for the quatix 3 include automatic uploads, live tracking, and social media sharing through Garmin Connect and the free Garmin Connect Mobile online fitness applications, plus optional downloads of unique apps for watch and smartphone integration. Box Dimensions (LxWxH) 5.0 x 3.8 x 3.6"
quatix 3 Marine Watch is rated 4.5 out of 5 by 2. Hi, please advice are you shipping garmin quatix 3 to Ukraine? Thanks! Unfortunately due to manufacturer's restrictions, we are unable to ship this item to Ukraine.